Previously, on MinerBumping... 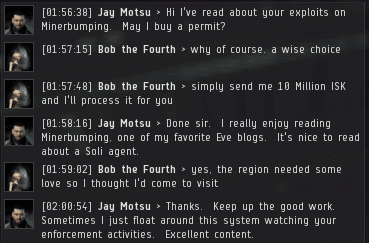 Agent Bob the Fourth's campaign in Solitude met with no resistance. Though miner Chance Mayfield and his friends repeatedly threatened to destroy Bob, they proved unable to put up even the slightest opposition. Chance Mayfield wasn't the only hauler-miner Bob came across. Such absurd and grotesque vessels were always a high priority target for our Agent. The hauler-miner was hopping mad after Bob brought him the Code. After ganking an unlicensed Retriever, Bob was reunited with Chance Mayfield. He still held a grudge. Would he act on it this time? 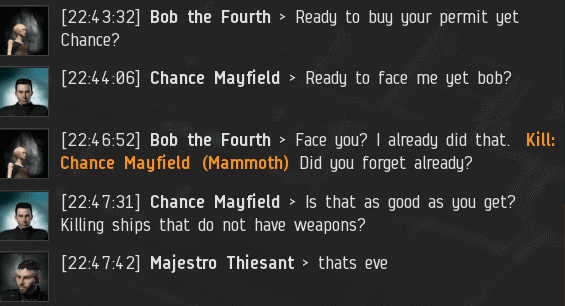 Chance hadn't learned anything about EVE since his last encounter with Bob. He hadn't gotten better at arguing, either. Still, the carebear bitterly clung to the idea of a miner-led resistance effort aimed at shutting Bob down. However, Agents of the New Order are far too powerful to be beaten. 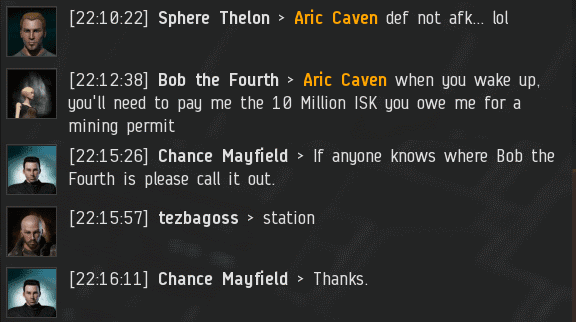 All the carebears in highsec couldn't stand against even one Agent. Not even if they returned to their keyboards. 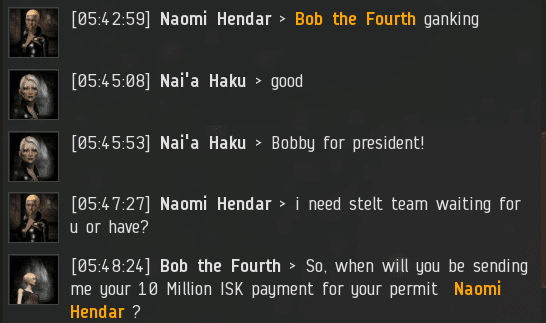 Though we know what the outcome of a highsec-wide uprising would be, it's worth pointing out one of the reasons why it will never happen: The organizers of the resistance have a tendency to humiliate themselves in local chat. The more they speak, the more they alienate potential supporters. 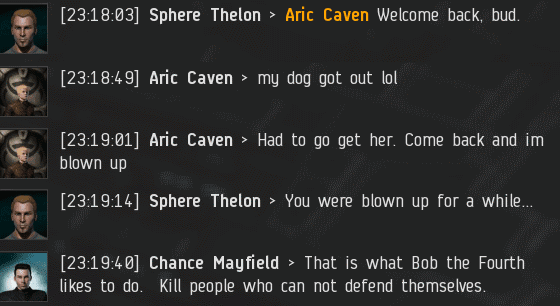 Eventually the Retriever pilot returned to local only to discover that Bob had bested him in elite PvP. It was a shame he wasn't there to see it. Actually, this miner had a believable excuse for being AFK: He'd been outsmarted by his dog. Chance Mayfield never did get around to exacting revenge against Bob. The Code enforcement would continue. Mackinaw pilot trish patrisha vowed revenge. Our Agents love shooting ships that shoot back, so Bob hoped against hope that trish would attempt something clever. As we all know, a rebel's promises are always empty. As Bob's campaign continued, he noticed the tide of public opinion turning in favor of the Code. 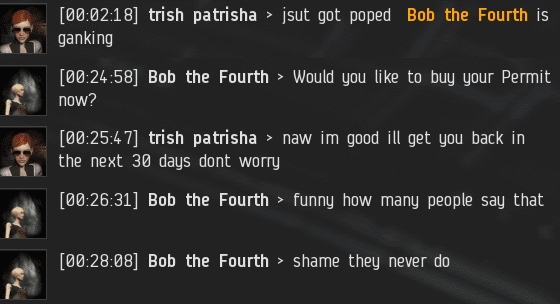 A new generation of EVE players has little patience for whiny, non-compliant carebears. They grew up with Agents like Bob. When conflict arises, they favor the Agents of the New Order. I suppose you might call them Generation Code. 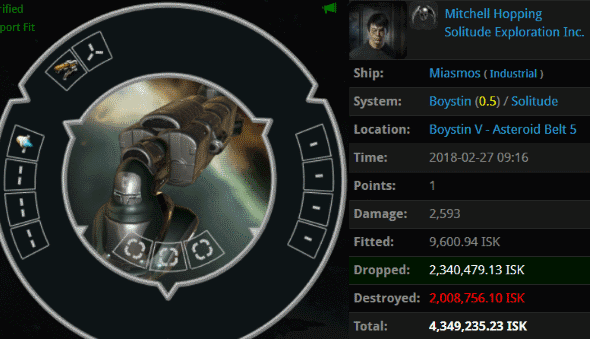 Carebears are useless, CCP should delete highsec. wow just wow antigankers are failing so hard right now. How do they do it so consistently? Is it a skill they have to train? I haven't seen the skillbook on the market. No skill, carebears are natural born losers.